Three kids down, and I still face this conundrum: What is the easiest way to go grocery shopping with a baby? 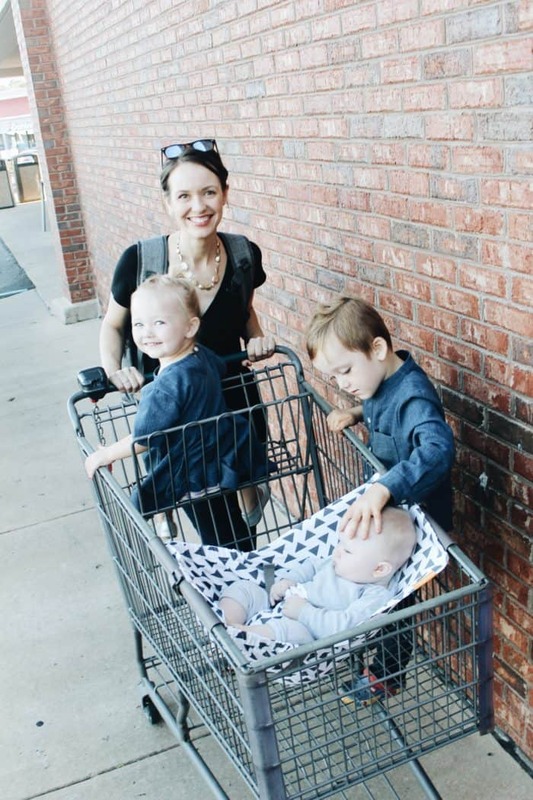 With new babies, I’ve always kept my baby in the car seat and put that in the shopping cart. (So, no room for groceries). However, my baby is off the charts huge for his age, so the car seat is HEAVY! Really, around 2 months I couldn’t carry it anymore without ripping my arm off, so I started baby wearing in the store. 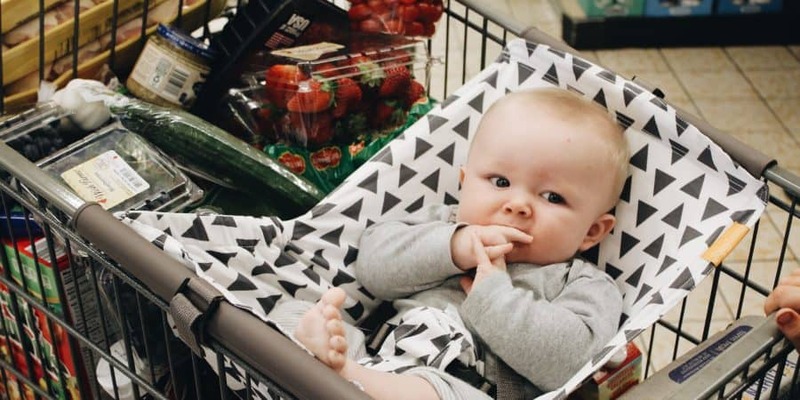 To experiment a bit, I’ve teamed up with Binxy Baby tell you what it was like using a Binxy Baby shopping cart hammock! This hammock was sent free to me to review, but all opinions and experiences are my own. This post contains affiliate links. What is a shopping cart hammock? I’d honestly never seen this until it popped up on my Instagram feed, and I thought, that’s a pretty nifty idea! 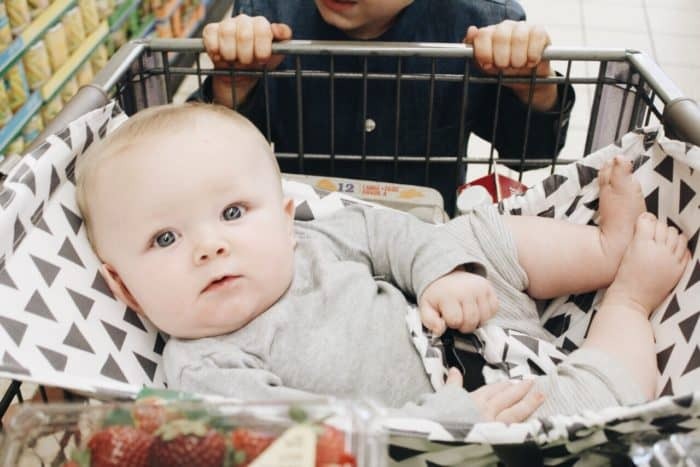 It’s basically a piece of fabric that securely straps across most size shopping carts and buckles in your baby. That way they are sort of chilling in the cart laying down. But even still, I was skeptical because there are just too many baby products out there. So, headed to Aldis, we went to get a weeks worth of groceries. We quickly attached it and I put Des in the hammock, Laila in the front of the cart, and Nigel walked. 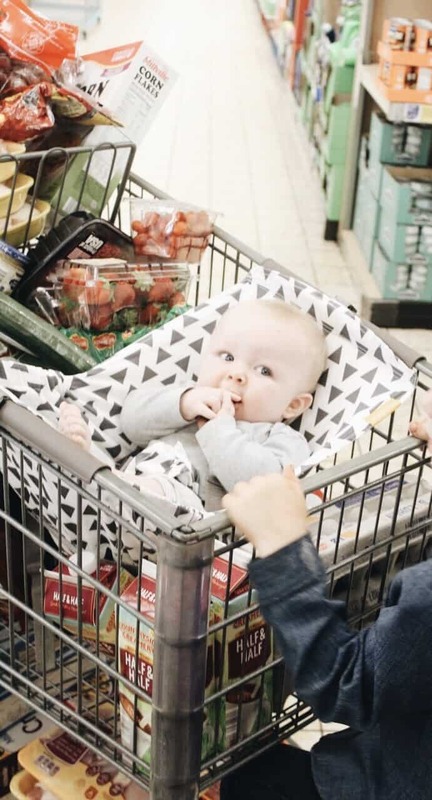 One nice thing about using a Binxy Baby shopping cart hammock is that it fits most grocery carts and can hold up to 50 lbs! It’s been tested and is safe for babies until they can sit up, usually around 6-8 months old. Here is an explanation of how to use it. My first thought was that it may be tricky to secure the hammock to the cart one handed if I was holding a baby in one arm. However, after doing it alone, it was not hard to secure one-handed at all! So, good news, it’s easy to attach, and the baby is buckled in. Just snap it to both sides of the cart, and secure the velcro straps. The hammock is pretty easy to use, and new! FYI a lot of people will stop and tell you, “That’s nifty!” Especially people your parent’s age, who never had anything like this. The Binxy Baby Hammock is so unique because a car seat can sit in it, or just the baby. This frees your cart up to actually put groceries in, without having to lift out a sleeping newborn from their car seat. In the past, my biggest problem with the car seat has been that it fills the WHOLE cart. Too bad I didn’t try this product 5 months ago when it would have sat right in this hammock! For reference, my son is 5 months and 20 lbs here. He is pretty long, so this hammock won’t be used too much longer. It has elastic on each side to safely stretch onto different size carts. It stretches long enough to fit a Costco or Target grocery cart which is wide! So while we can do a wide cart no problem, Lowe’s and Dollar Store carts were a bit too narrow and his head was all scrunched. Wish I tried this when he was smaller! We stopped using this around 6 months when he was starting to try and sit up in it. Once he started to grab the sides of the cart and try and pull himself to a sitting position I knew it wasn’t a good idea anymore! I switched back to baby wearing in the store for a couple of months until he could sit up well enough to sit with Laila in the front of the shopping cart buckled in. I would also highly recommend bringing a baby carrier too. One time we were shopping at Lowes and Desmond just needed momma to pick him up…nap time baby. I didn’t have my Boba and so just carried him around for the next 20 minutes or so till my arm wanted to fall off. This was fine because Peter was there to help with the kids and to get out his wallet, but it would have been really hard to do one handed I think. He just laid there happily the whole time, around 45 minutes looking around! I was kind of surprised actually. Not a peep! I liked it because I didn’t have 20 lbs to carry, and I could still fit almost the same amount of groceries in the cart. The kids also liked it because they could peek at him. Related Post: Things you can do when you are so so tired as a mom! The weirdest part of using this hammock was having to kind of stuff groceries underneath the baby. I kind of tuck groceries under the hammock but that was not a big deal. Binxy Baby Coupon for you! You can get 10% off your order! Just go here to purchase. Let me know if you try this and like it! Or hate it too, but I don’t expect I’ll see any of those comments because you will wish you tried this sooner. I would definitely rate this as a non-necessary item but a super helpful item that if you have the money to spend will make grocery shopping easier! Also, you can follow Blue and Hazel on Instagram here!